Written by: Ed James. Directed by: Charles Barton. We begin with mail call at the Davis apartment. Even Buffy and Jody receive mail. 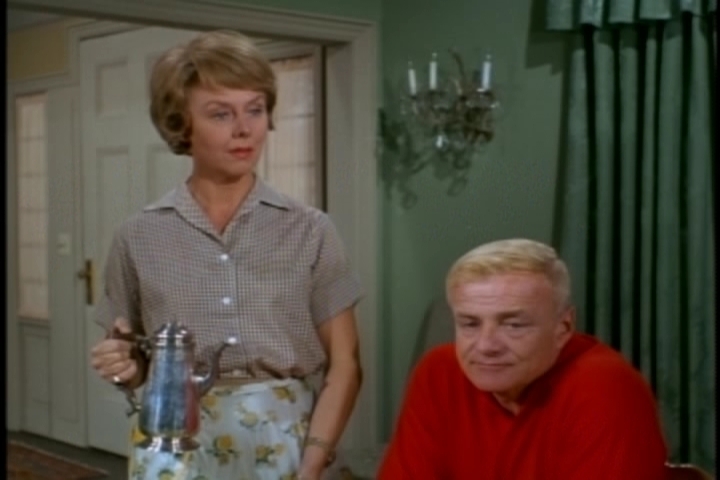 Cissy reacts with alarm to a letter she receives. It’s from Aunt Fran! A faint whiff of sulfur coming from the envelope was probably the first hint. Fran has written that she’s looking forward to seeing the children again. (“Mwah-hah-hah” is implied at the end of the sentence). 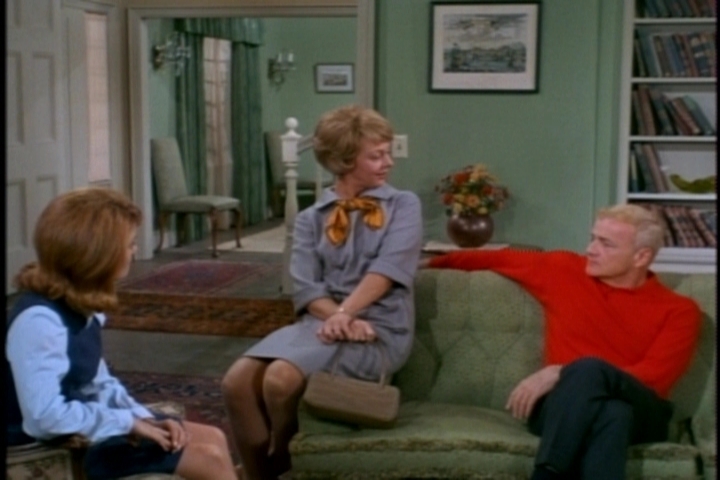 The kids are relieved when Uncle BIll explains that Fran is talking about a visit, not a permanent move. It seems she’s hosting a family reunion at her home in Terre Haute and wants Bill and the kids to attend. Bill had already decide to decline because he fears the trip will stir up traumatic memories for everyone. 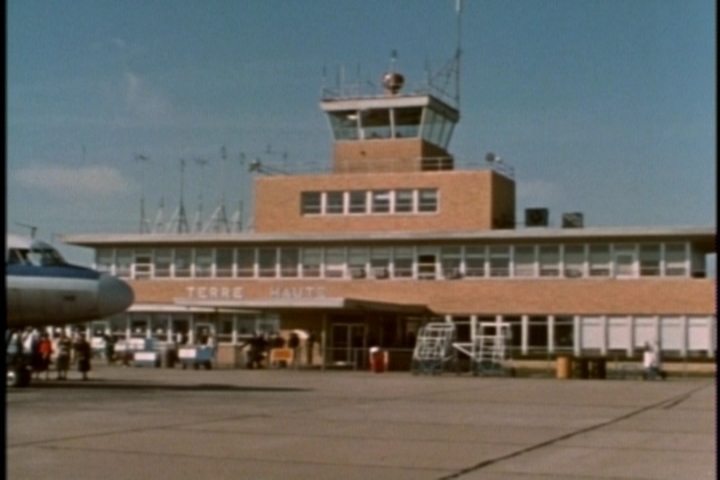 One can travel by air from New York to Terre Haute in about two hours–or five establishing shots. …before arriving at Aunt Fran’s rather grand house. 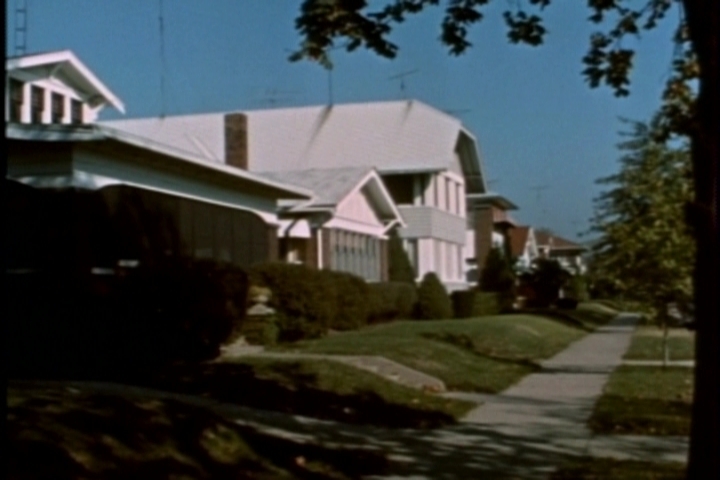 Buffy points out that this is a new house–not the one where she lived with Aunt Fran. Since it’s almost time for school to let out, Cissy heads off to the high school to surprise old friends, while the twins convince French to take them to their old kindergarten classroom. Yes, Bill brought his man-servant along on the trip. His luggage isn’t going to unpack itself, you know. 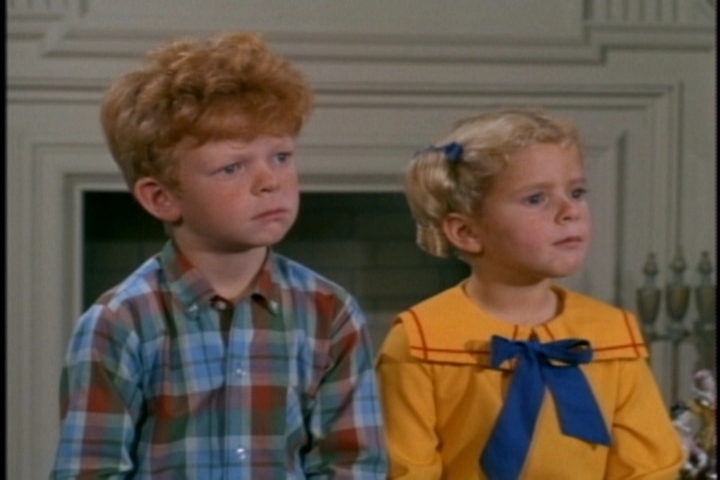 That leaves Bill alone with Aunt Fran, who promptly confesses that she’s sorry to see the kids looking so well-adjusted. Yep, that’s our Aunt Fran. It seems she has hopes of stealing them away. How has she progressed from ditching Buffy, to wanting the girls, to wanting all three kids? Beats me. Uncle Bill just stands there looking uncomfortable. When the kids return, they are bursting with excitement about their school visits. Cissy is anxious to get reacquainted with a boy named Harvey who has blossomed into a star athlete. 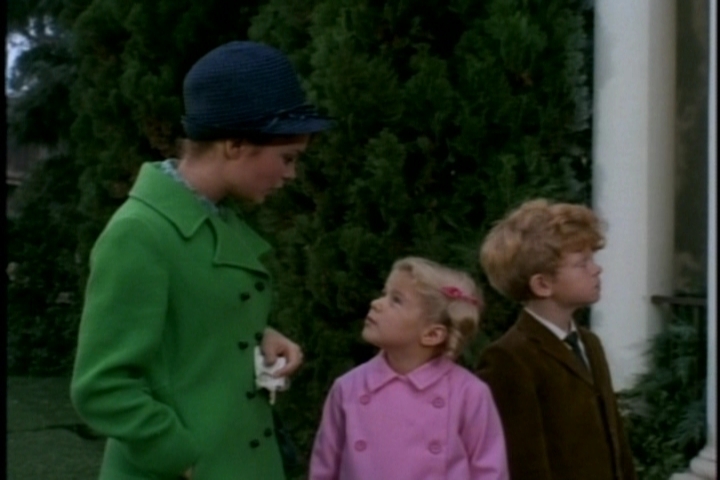 Buffy and Jody saw their old kindergarten teacher, who gave them cookies. Out of the kids’ presence, Fran corners Bill and makes him promise that he will watch the kids over the next few days and consider whether they would be happier in Terre Haute. 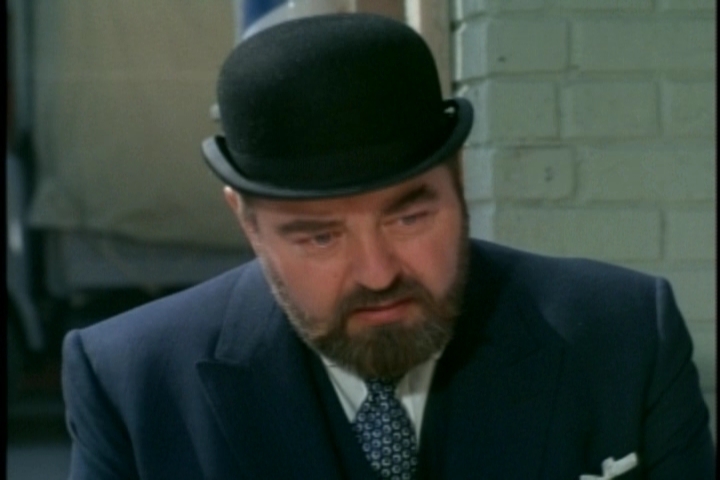 The director seems to use some kind of soft-focus filter on Louise Latham’s close-ups, which are noticeably “blurrier” than any other shots. The next day, Cissy heads off with Harvey to explore her old stomping grounds. She acts surprised every time she remembers something, as if it is a feat for teenager to remember a place where she lived less than two years before. Harvey remarks on how she has changed since leaving Indiana–she’s now a sophisticated New York woman. He asks her to join him for the junior dance, but it’s more than two weeks away. 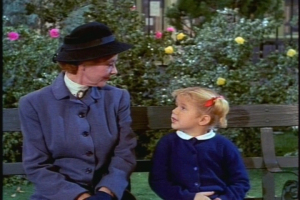 Cissy says she can’t stay that long, and she doubts Uncle Bill will let her fly back alone for the dance. Wearing his default expression of puzzlement, Harvey observes that Bill must be strict. No, Cissy replies. He just cares about her and the twins. Cut to the twins themselves, who are showing French their old playground and that huge slide they remembered. “If you leave a slide out in the rain, can it shrink?” Jody asks, leaving French to explain that the slide just seems smaller since the twins have grown. Back at home, the ever-gracious Uncle Harold is grumbling about grocery prices. He says he can remember when he couldn’t carry all the bread that thirty cents could buy. Sure doesn’t sound like a guy who’d want to add three extra mouths to his household. 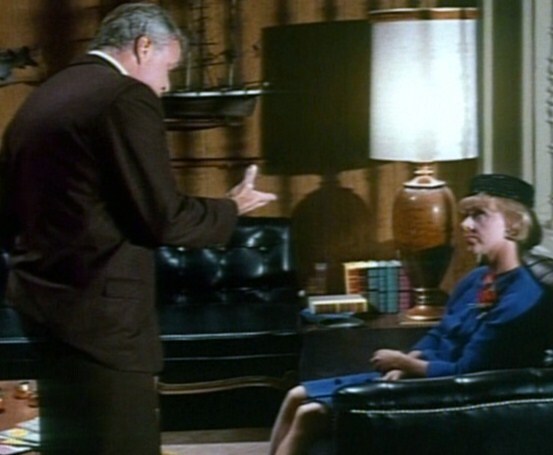 Cissy asks Bill about flying back for the dance. He says no, as she expected. Aunt Fran knows an opportunity when she sees one, though. She suggests that all the kids stay with her until the dance. The kids can attend their old schools, she says, and French and Uncle Bill can have a break. Uh-oh. You’d think by now Bill would know how that kind of talk affects the kids. He agrees to consider the plan, though. Random breakfast observations: Fran looks even creepier when she wears an apron. Also, Bill is wearing the same shirt he wore the day before. Bill tells Fran that he and the kids will be leaving on Sunday after the family reunion. As it turns out, even that isn’t soon enough, as bad memories begin to plague the kids. Harvey and Cissy visit a local lake and she remarks on its beauty. Harvey scrunches up his face in confusion once again and wonders what’s so beautiful about it. 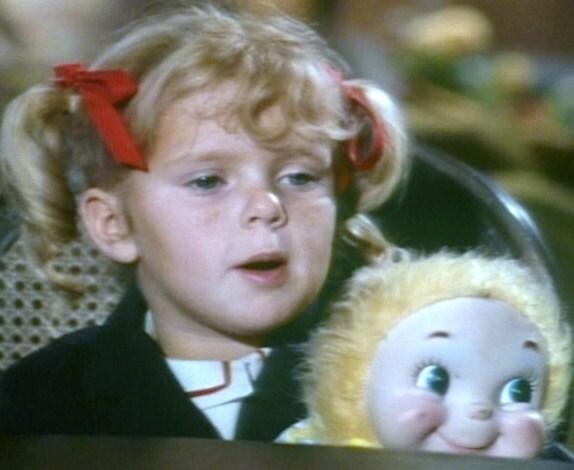 Cissy grows wistful as she remembers picnics at the lake with her parents in the years before Buffy and Jody were born. Kathy Garver does a good job expressing genuine emotion in this scene. First they stop outside a drug store and remember going there for ice cream with their parents. 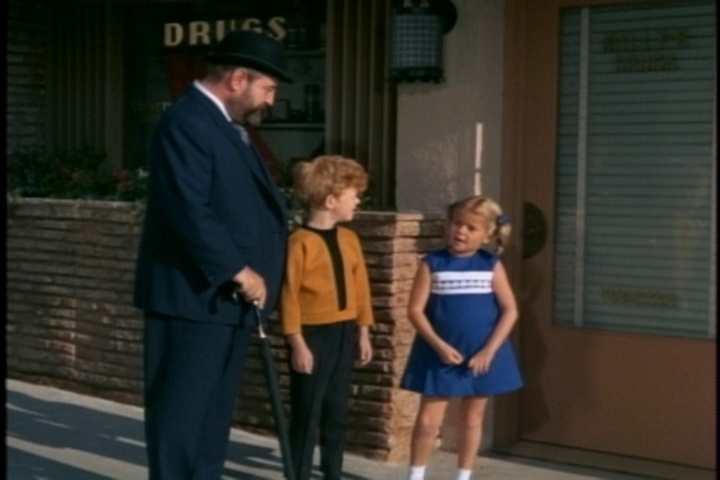 Then they stop outside the very toy store where Buffy got Mrs. Beasley. (As French jokes, it should be marked with a plaque.) She remembers walking down the street with her mother, who spied the doll and thought it was the cutest thing she’d ever seen. She took Buffy into the store and bought her the doll on the spot. Outside the barber shop, Jody remembers getting his hair cut side-by-side with his dad, who would joke that Jody might need a shave in a few weeks. 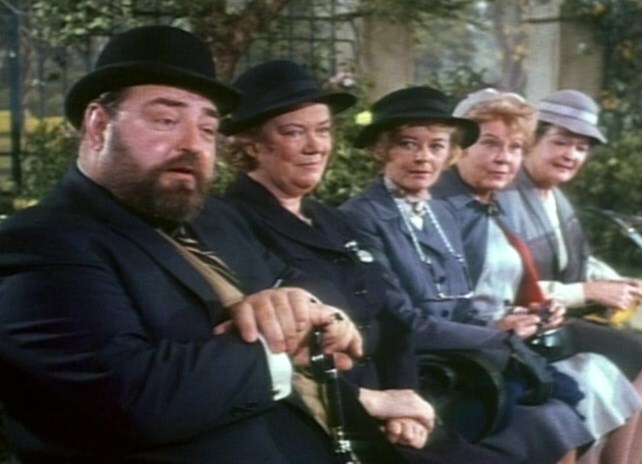 More acting props: Sebastian Cabot’s reactions to the kids are perfect here–tender, while maintaining French’s characteristic restraint. 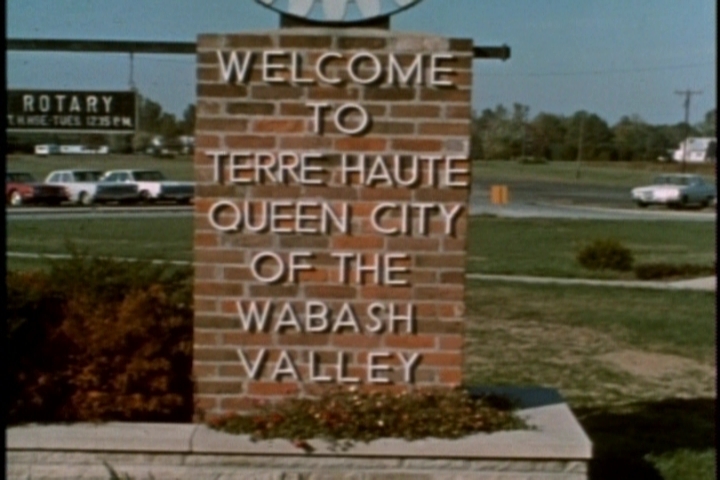 The twins decide they’ve seen enough of Terre Haute and ask French to take them back to the house. Later, the kids beg Bill to take them home right away, and he agrees. Sadly, we don’t get to see Aunt Fran’s reaction to their departure. Or that of Head-Wrinkle Harvey. Back at home, the twins are happy that their respective pets are still alive. And Bill, relieved that the whole ordeal is over, is eager for the drink that French promises to fix him. 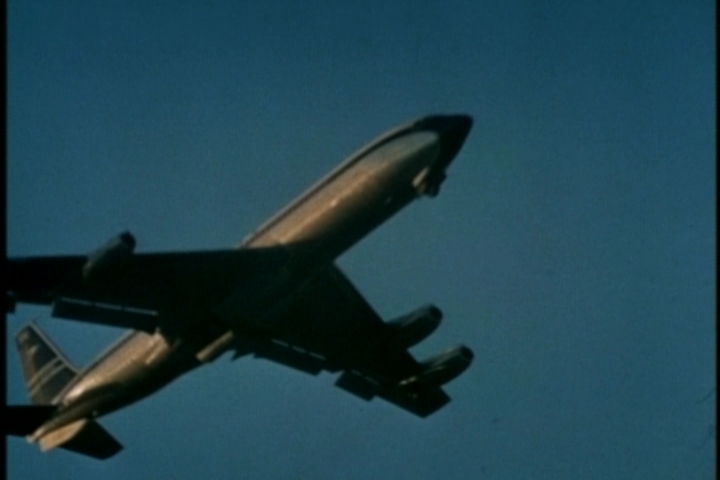 This episode exudes the underlying sadness that makes Family Affair so unusual. 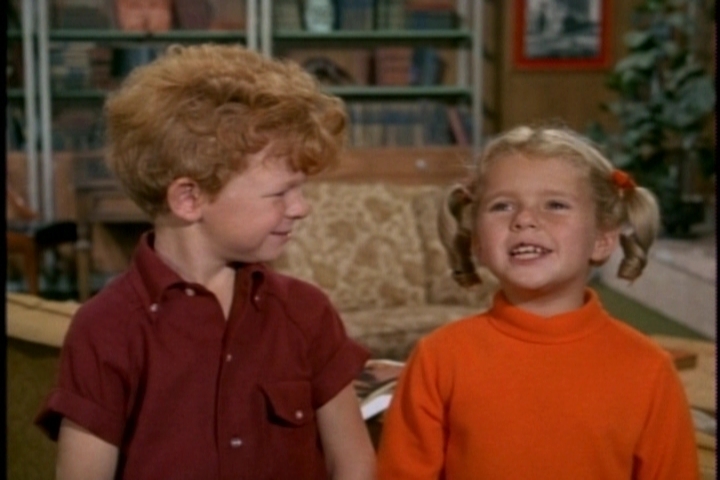 Many shows of that era featured kids who had lost a parent and then promptly forgotten that parent ever existed. 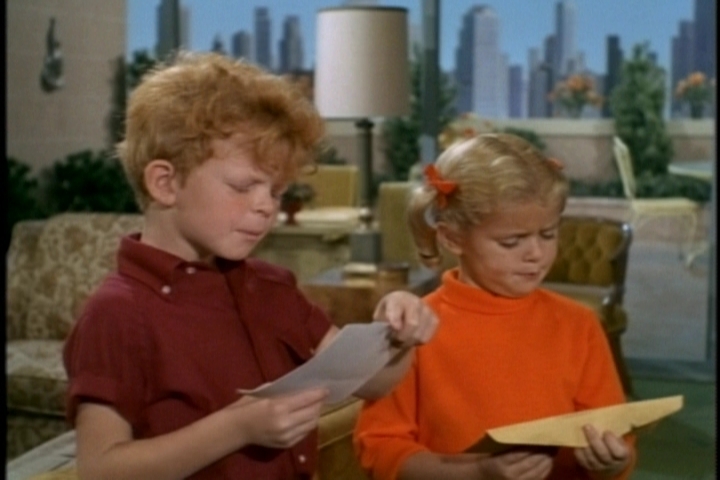 I love the fact that Family Affair revisited the kids’ grief every so often. The twins’ walk with French is especially moving and well scripted, with a realistic amount of detail surrounding each memory. Fran Higer: Louise Latham. Harold Higer: Bill Zuckert. Harvey: Jim Henaghan. Sadly, this was Latham’s last appearance as the aunt we love to hate. They should have brought her back once a year. By season five, she could have escalated to building a bunker prison for the kids in her basement. The kids’ mother had a beautiful singing voice. Buffy has a goldfish. 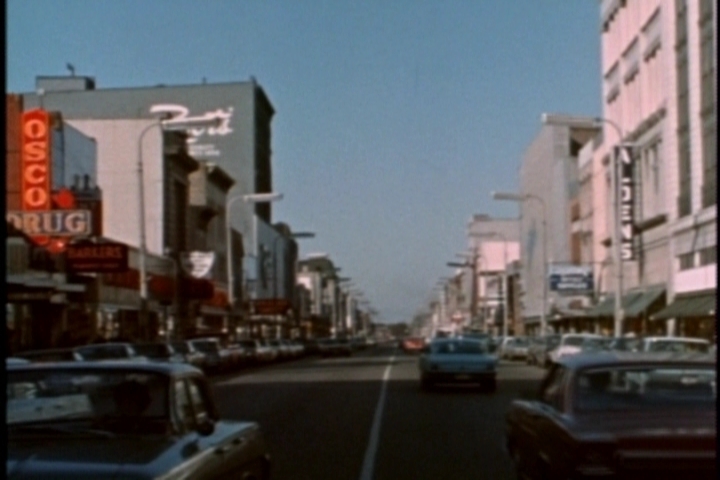 The entire episode refers back to the show’s origin. Also, Jody’s turtle gets another shout-out–Scotty fed it while the family was out of town. A Pronunciation Digression: Terre What? Welcome to another installment of Family Affair Friday! 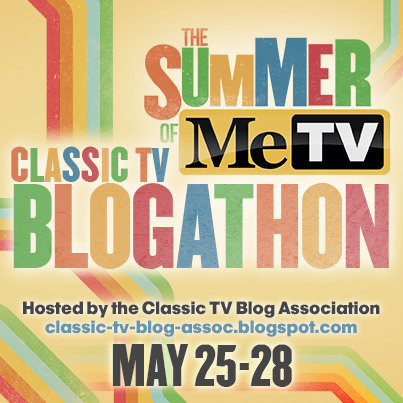 Sorry it’s late–I’m blogging from the depths of migraine hell this weekend. Written by: Austin and Irma Kalish. Directed by: William D. Russell. 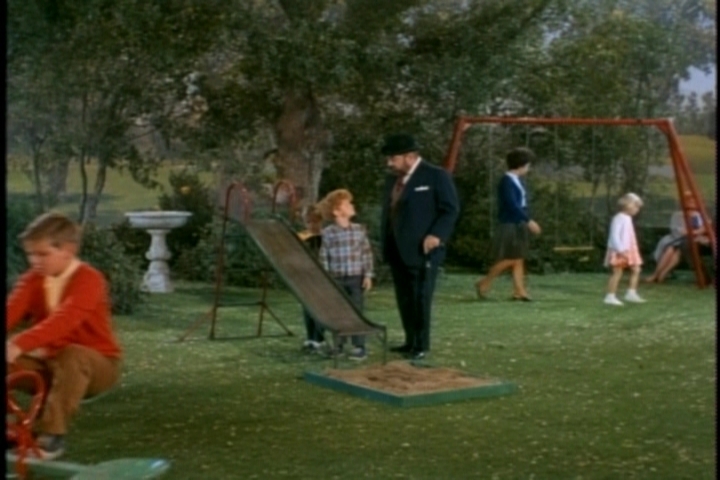 Mr. French and Cissy are out, so Uncle Bill sacrifices a bowling game to stay home with Buffy and Jody. Here he is canceling his bowling plans, explaining to his friend that he’s “stuck with the kids.” Ouch. Well, he didn’t know Buffy was behind him. After he hangs up and begins talking to Buffy, the phone rings again.This time it’s one of his many lady friends, and he uses the expression “stuck with the kids” again. Way to go, Uncle Bill. This time you knew she was nearby. 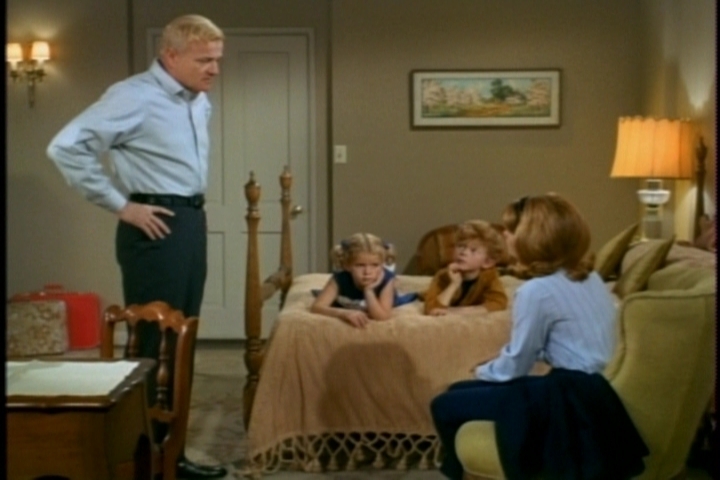 Uncle Bill and the twins go on to have a pleasant evening, but Uncle Bill’s words are still worrying Buffy at bedtime. Unfortunately, her insecurities make her easy prey from the evil force that blows in the next day from the mid-west. Look, kids! It’s Aunt Fran! The nice lady who brought Buffy here and left her because her husband couldn’t get along with a 6-year-old orphan. Buffy’s overjoyed to see her aunt again. Aunt Fran tells Uncle Bill that Uncle Harold’s feelings have changed, and they both want Buffy back. 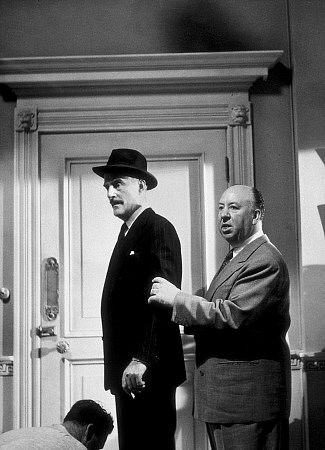 Harold’s gotten a new job, they have a bigger house now, and they’ve hired “the Indiana version of Mr. French.” They’re even willing to take Cissy–isn’t that big of them? And Fran’s sister in Terre Haute will take Jody. 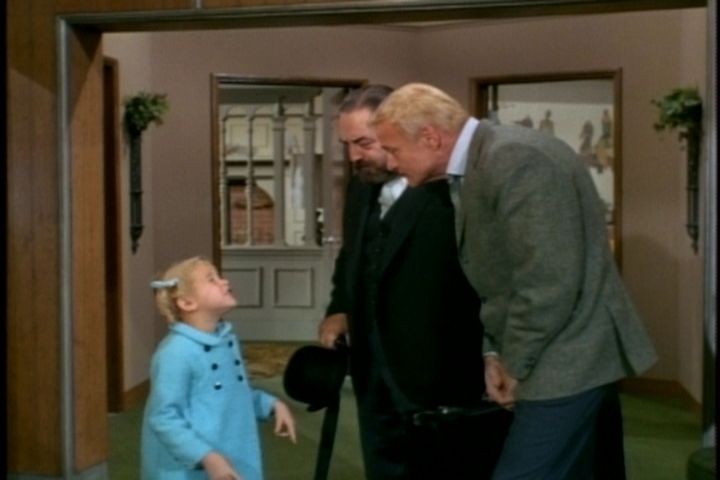 Of course, Uncle Bill wants the kids to stay with him, but Fran the Manipulator starts him doubting whether that’s what’s best for them. Everyday, he admits, people tell him how much better off kids are with a mother. (He must have some really rude friends.) Finally, he decides to leave it up to the kids. Fran’s quick to work her magic on them, too. 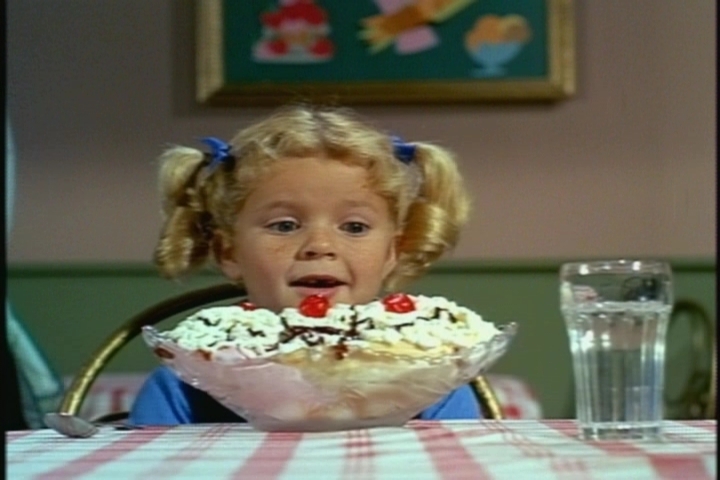 Don’t eat it, Buffy, Aunt Fran’s probably put a spell on it. She treats Buffy and Cissy to an afternoon of shopping, forbidden desserts, and mind games, convincing them that Uncle Bill would be happier without them. 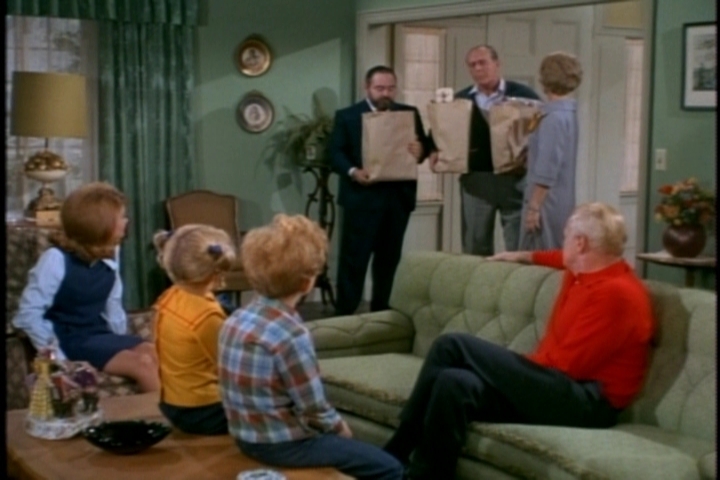 The kids reluctantly agree, and Uncle Bill tries to conceal his heartbreak at their decision. 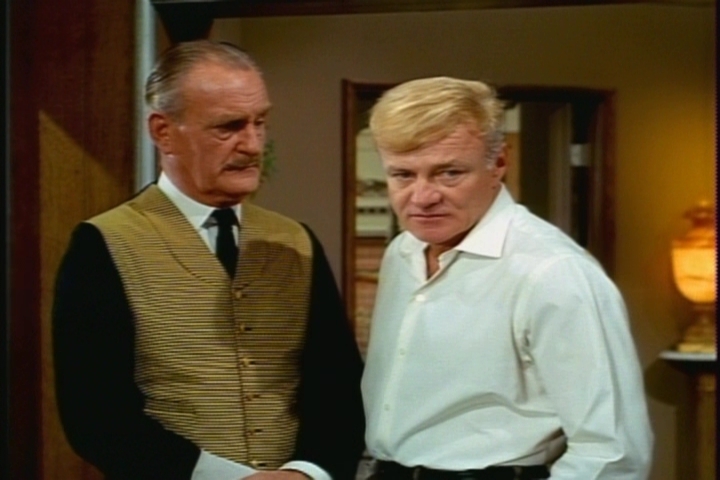 Uncle Bill and French share a sad conversation about the kids’ impending departure. 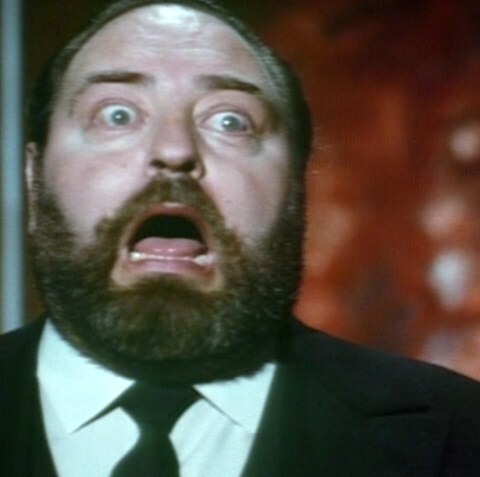 It would be more moving if this was the real Mr. French. Written by: Edmund Hartmann. Directed by: James Sheldon. 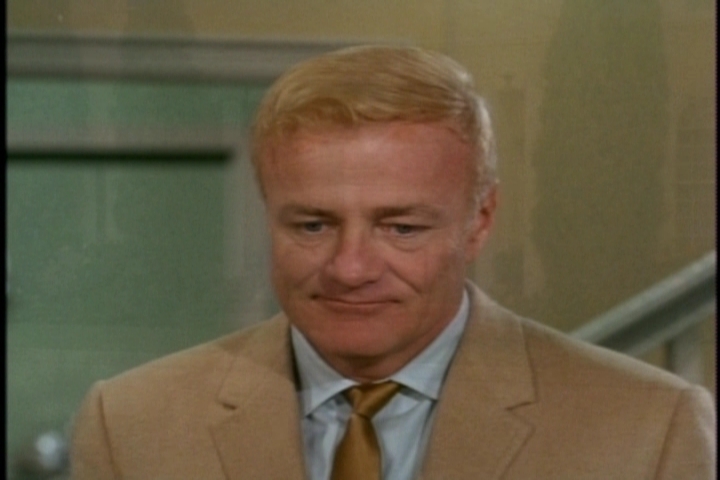 Successful construction engineer Bill Davis resides in what his gentleman’s gentleman French refers to as “the quiet, monastic atmosphere of the bachelor apartment.” (“Monastic” is a bit ironic–Bill’s calendar shows him dating four women in less than a week.) 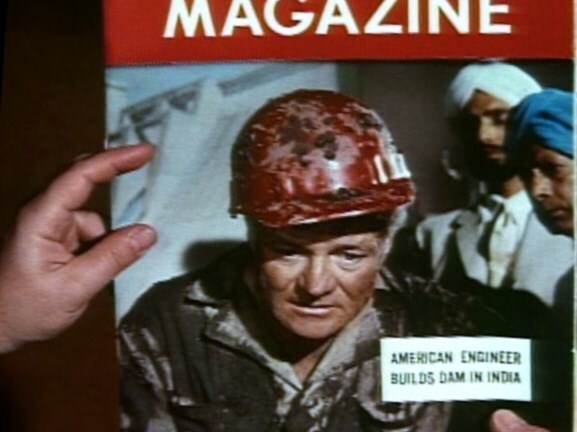 As we meet him, he is returning from work in India that was successful enough to land him on the cover of World magazine. Without warning, Fran Higer arrives from Terre Haute, Ind., with Bill’s young niece, Buffy. Buffy’s parents were killed in an “accident,” presumably a car accident, about a year before. Bill was in Turkey at the time, and Buffy and her siblings were separated and placed with various relatives in Terre Haute. Fran wants Buffy to live with Bill because the child–defiant and unemotional–can’t get along with Mr. Higer. Believing that his bachelor status and frequent travels make him unsuitable as a father figure, Bill resists. Meanwhile, French is appalled at having to perform such duties as serving milk and cookies and escorting Buffy to the bathroom. He calls her “a little clot,” and she responds by biting his leg. French, bitten. Well, he sort of had it coming. Bill gently reprimands Buffy and tries to make her see that living with him would not be ideal for her. “Why don’t you want me to live with you?” she asks flatly. During this conversation, Fran slips out and leaves Buffy behind. The next morning, Buffy overhears Bill telling French that he is sending her back to Terre Haute. Buffy spends the day with French in the park, where French faces teasing from a group of nannies who believe he has joined their ranks. At the suggestion of his partner, Ted Gaynor, Bill decides to send Buffy to school in Switzerland rather than back to Terre Haute. 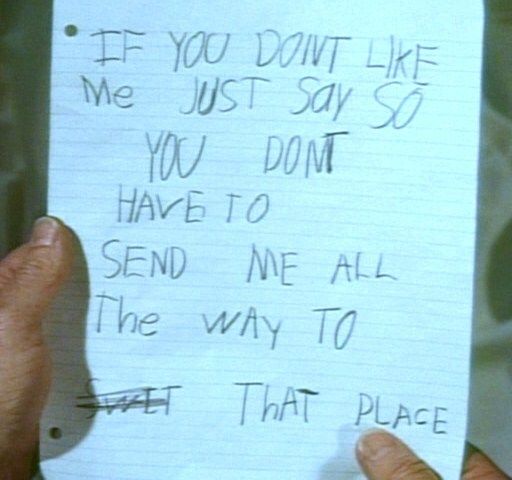 When he tells Buffy, she is characteristically unresponsive, but in her room she cries and writes a farewell note. Years of nanny experience help French’s friend Miss Faversham lead French to Buffy’s hiding place in the basement. When Uncle Bill realizes how upset she is, he tells her she can stay. “Grown-ups always tell you things like that at night to make you go to sleep. It’s all different in the morning,” she replies. 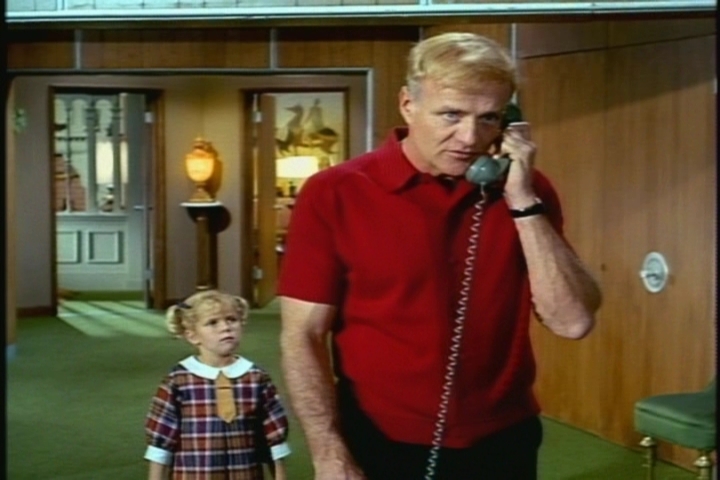 Uncle Bill assures her that he’s telling the truth and tells her that he loves her. For the first time, Buffy smiles and stops her curt “Yes, sir,” “No, sir,” answers. Awww to the infinite power. This is a good pilot that sets up the show’s situation with equal parts comedy and pathos. 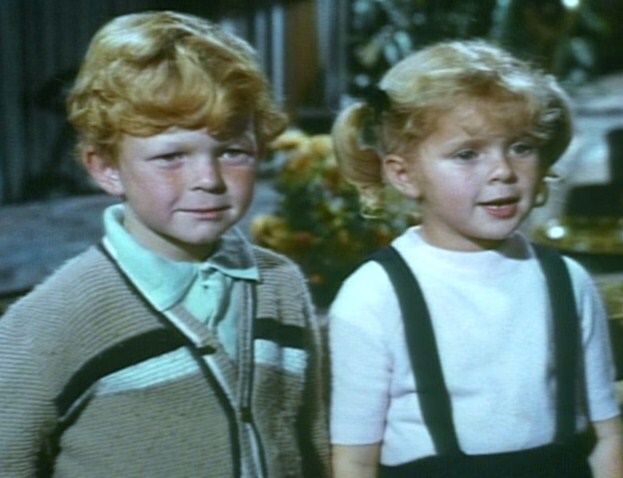 Tiny Anissa Jones and Johnnie Whitaker are at their most adorable. 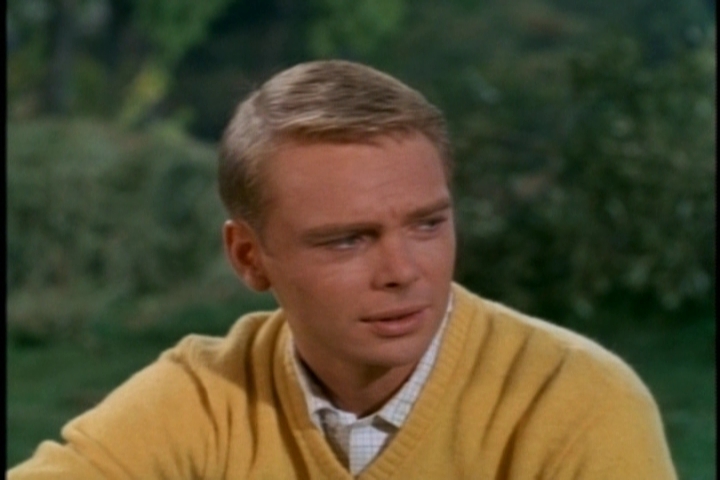 Jones’ portrayal is mostly deadpan, but that’s appropriate for Buffy’s mental state. Buffy’s apparently suffered some harsh treatment in her prior home, considering her remark about being stuck in a closet as punishment and her cynicism about adults’ sincerity. Fran’s behavior here–dumping Buffy at the apartment and sneaking out–is pretty disgusting. I guess a charitable interpretation is that she knew Buffy and Uncle Bill would be better off together, and that Bill would come around in time. Mr. Higer sounds like a real jerk–what kind of person can’t be patient with a recently orphaned child? The oh-so-sensitive Aunt Fran. By the way, the books in Uncle Bill’s den seem to be of the Reader’s Digest condensed variety. I know he’s a busy man, but really. 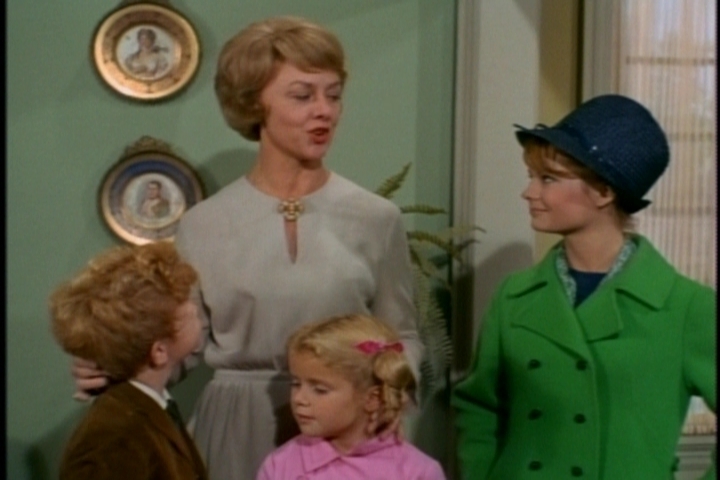 The pilot version of Mrs. Beasley lacks glasses and has a creepier face than the one used throughout the series. 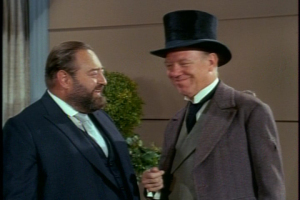 Brian Keith and Sebastian Cabot are both wonderful in this episode. Keith exudes warmth in his emotional scene with Buffy, and Cabot conveys wonderful disgust with the whole idea of child care. Jody: Does he like kids? Buffy: I don’t think so. Jody: Could he run fast? Jody: (After a thoughtful pause) Okay, I’ll stay. Ted Gaynor: Philip Ober. 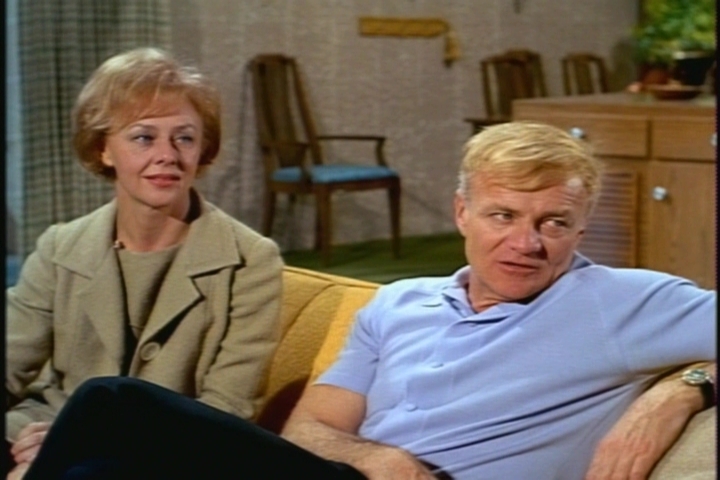 Among Ober’s many guest appearances were two on I Love Lucy–not surprising since he was once married to Vivian Vance. 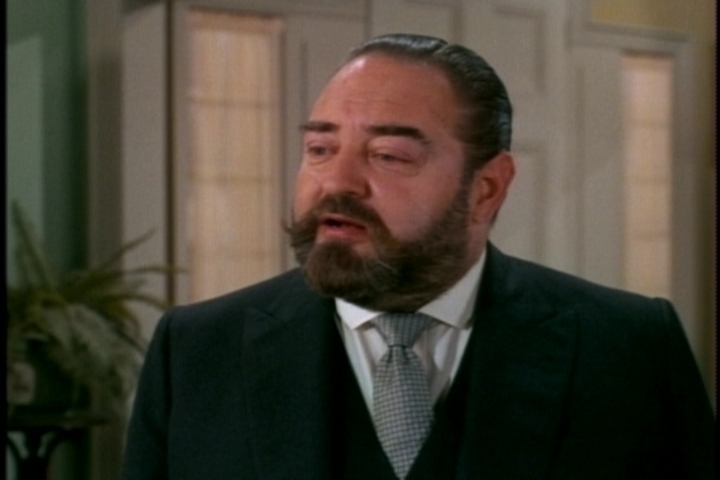 He appeared twice on Sebastian Cabot’s early 1960s series Checkmate (which is available on DVD–wow). 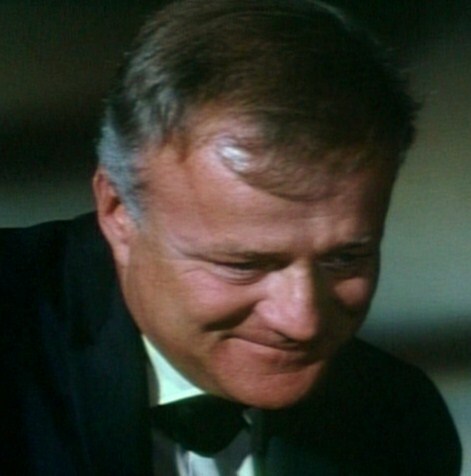 He also appeared in many movies, including North by Northwest and From Here to Eternity. Fran Higer: Louise Latham, who would return twice as Aunt Fran. 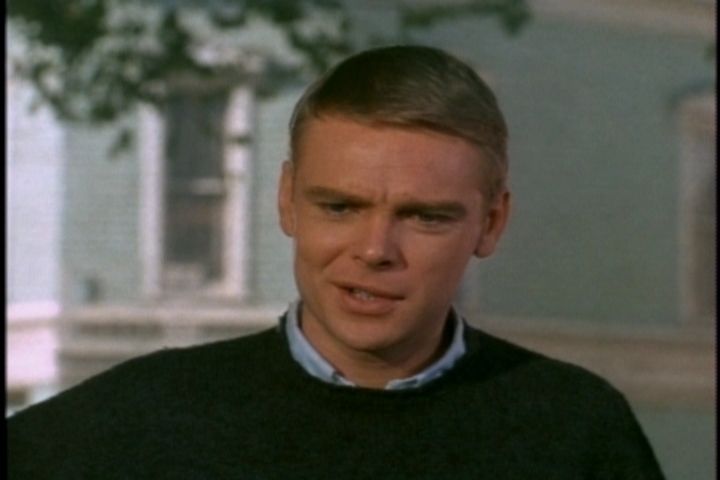 Latham’s career spanned from Perry Mason and Gunsmoke in the ’50s to CHiPs and The Waltons in the ’70s, Designing Women and Hunter in the ’80s; E.R. in the ’90s; and The X-Files in 2000. 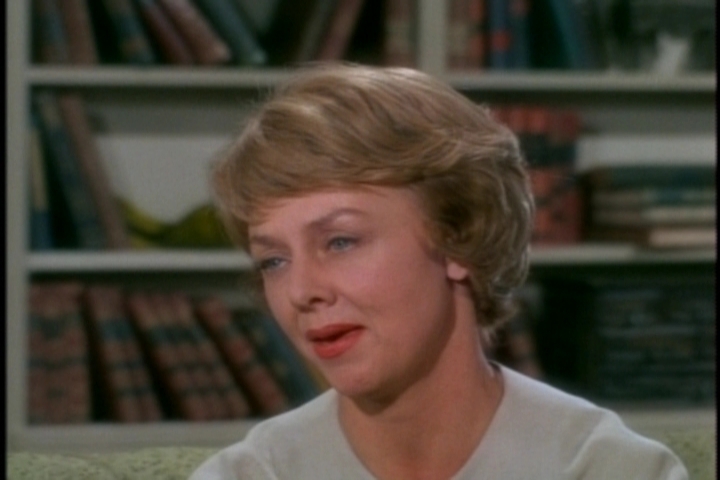 Her first movie role was as the title character’s mother in Hitchcock’s Marnie. Miss Faversham: Heather Angel. 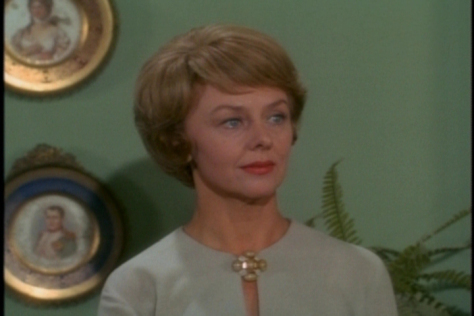 She appeared in many movies, including That Hamilton Woman and Suspicion. She also did voices in Disney’s Alice in Wonderland and Peter Pan. Her Family Affair role would be a recurring one. Critics didn’t exactly embrace Family Affair. 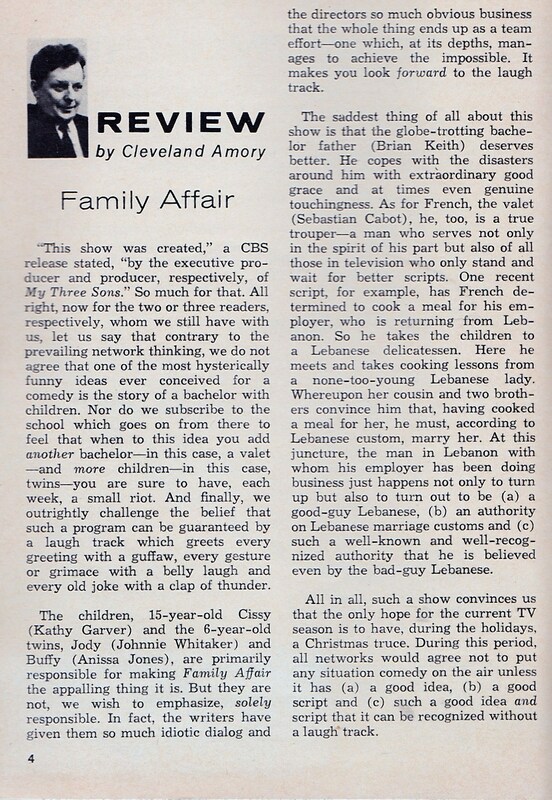 Though I like the show, I find this snarky Cleveland Amory review from the December 24, 1966 TV Guide pretty amusing. Uncle Bill is not fond of ballet. Bill’s business partner is Ted Gaynor.